Disclaimer: I am not an art critic, and did not study Art History. I’m simply crazy about Contemporary Art. In my quest for knowledge I slowly learn as I go, and while I’m not going to love, understand or appreciate everything I see, each museum exhibit or gallery visit I attend opens my eyes and expands my broader view of the arts. My love for Art is a close second to my love for FOOD. Because I live in the hinterlands north of Los Angeles, my access to quality restaurants is quite limited and as a result I am slightly obsessed with food shows on Bravo and the Travel Network. I’ll connect the dots between these two loves in a minute, but first I want to share my thoughts on the De Young Museum’s “Birth Of Impressionism”, an exhibit I saw in San Francisco last month. This was a beautifully curated collection of over 100 works of art on loan from the world renown Museum D’Orsay in Paris. For neophytes to Impressionism, the exhibit takes visitors on a tour of the artistic landscape of Paris. At that time the art world was ruled by the legendary Salon. They called the shots and dictated the accepted forms of art at the time. The Salon was literally the key to an artist’s success; to be shown here meant that your work would have a legitimate prominence in the art community. The Salon consisted of critics and juries who developed the strict guidelines by which artist’s work was judged. As a result descendents of Baroque art were the hailed as the golden children and disparate art forms were publicly shunned. As the number of rejects grew, a smoldering cauldron of discontent among those rejected artists was forming. Their work was deemed too crude, pedantic, common and vulgar for the sophisticated sensibilities of Paris’ art community. Those cast away artists included Manet, Monet, Whistler, and the father of Modern Art, Cezanne. It was amazing to me that these artistic masters where once shunned and dismissed as miscreants by critics and the Salon. These misfits formed a loose fraternity founded on the insecurity of rejection yet fueled by their desire to show the world their unconventional approach to composition, color and light. They mentored each other, collaborated with one another and painted together; they even banned together for group shows located across the street from the Salon. The controversial splinter group was satirically dubbed the “Impressionists” by critics, a slur that the artists later embraced as their own and revolutionized the world of art. While the Impressionists had their distinct styles in their approach they shared a consistent commonality rooted in frenetic brush strokes. The style evoked a palpable kinetic energy that illuminates the time and the conditions they were painting in. To see the foundation for the genre of Art that I most relate to really gave me a more comprehensive appreciation for Modern Art and its fascinating roots. So, what does this have to do with food? Today while I was finishing this post, I watched the 100th episode of Anthony Bourdain’s “No Reservations”. The show was shot in Paris and explored the origins of a “dining revolution” pitting the culinary old guard dedicated to Michelin stars against a group of up and coming culinary rebels dedicated to changing our view of dining establishments. It was a fascinating look into a growing movement that exposes people to fine dining without the pretension associated with a Michelin rated restaurant. Some of the chefs featured on the show were not classically trained yet they presented beautifully prepared dishes at affordable prices. Their prix fixe menus change daily based on what is available. The origins of this rebel group go back 10 years when young chefs would come together with DJs and graphic artists in spontaneous, festive gatherings of good food, art and music. To these chefs who put their heart and soul into the dishes they prepare, “food” and “feeling” are inextricably tied, and “Le Fooding” was born. 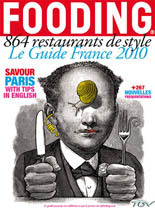 Le Fooding grew into food festivals and later a publication that showcases the burgeoning talent of these otherwise unknown chefs all seeking to challenge the status quo in fine dining. If you’re in Los Angeles and ever visited a Gourmet Food Truck, an Underground restaurant or one of chef Ludo Lefebvre’s “Pop Up” restaurants, then you’ve scratched the surface of what this movement is about. While I think Los Angeles’ foray into this space is more economic and trendy vs philosophical, it’s an interesting glimpse into the changes that are slowly taking place in the Los Angeles arts and dining scene. What an astute observation and what a gift are the senses! Appreciation of Art, good Food and Music allow us to tease all our senses…Sight, Taste, Smell, Touch and Hearing. Thank you for sharing, as you open yourself to new artistic experiences you help others to do the same. Isn’t that what the artists, chefs and musicians are doing? I couldn’t agree with you more! The Fooding festivals are figuratively and literally a feast for the senses! Next Next post: Art, Drinks and Food Trucks: A Match Made in Heaven or a Recipe for Disaster?